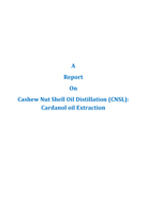 Cashew Nut Shell Liquid (CNSL) or Cashew Oil or Cashew Nut Shell Oil is a dark reddish brown viscous liquid, extracted from a soft honey comb structure inside the cashew shell. It is a natural and renewable biomaterial. Thus, it offers much advantage over synthetics. CNSL is often considered as cost effective and better modern materials for unsaturated phenols.